This time the outspoken US ambassador in Berlin may have gone too far to be ignored. The German government has denounced as a “provocation” letters that the American envoy sent to companies involved in the Nord Stream 2 project warning them of possible US sanctions. The German government reportedly told the project companies to “ignore” the missives dispatched by Ambassador Richard Grenell. Nord Stream 2 is the 1,222-kilometer pipeline being laid in the Baltic seabed which will greatly increase delivery of natural gas from Russia to Germany. It will double Germany’s import of Russian gas when complete. But the Trump administration has repeatedly voiced its objection to the project, claiming that it will give Moscow undue political leverage over Europe. Trump has warned of sanctions on participating companies, which include German and Austrian firms. The flagrant ulterior agenda is seen as the US trying to undermine German-Russian energy trade, for the purpose of selling more expensive American liquefied natural gas to Europe. So much for American free-market capitalism! 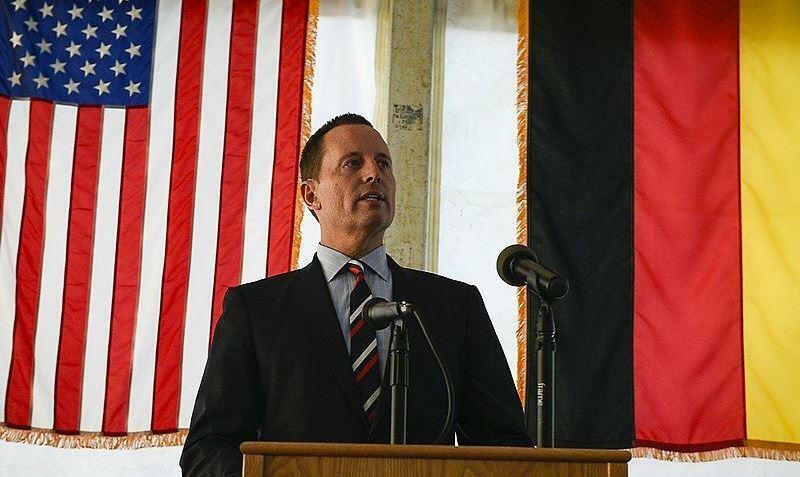 Grenell’s letters to the German firms – received at the weekend – are viewed as an unprecedented threat to the nation’s conduct of private business. The US embassy denied it was a threat, saying the letters were merely stating Washington’s policy of imposing sanctions. It is but the latest furore involving the maverick envoy who has been accused in the past of violating diplomatic protocol by meddling in Germany’s domestic affairs. German media have previously blasted Grenell for seeking “regime change” in Berlin because of his open support for the anti-immigration party, Alternative for Germany (AfD). When Grenell took up his diplomatic post in Berlin last May, he immediately provoked a political firestorm when he tweeted that German companies doing business with Iran “should wind down operations” or face punitive American sanctions. That was at the time President Trump pulled out of the international nuclear accord with Iran. “Never tell the host country what to do, if you want to stay out of trouble,” snapped Wolfgang Ischinger, Germany’s former ambassador to Washington. Only a few weeks after that dubious debut, Grenell gave an interview to the pro-Trump Breibart News outlet, boasting that he wanted to “empower other conservatives throughout Europe”. That was taken as an endorsement of the AfD in Germany, which has emerged as a serious challenger to the political establishment in Berlin. Martin Schulz, the former leader of the Social Democratic Party, was among several political figures who then demanded Grenell’s dismissal. “What this man is doing is unheard of in international diplomacy… he’s behaving like a colonial officer of the far-right,” said Schulz. Grenell’s high-profile media interventions concerning German politics and business do appear to constitute a brazen breach of the 1964 Vienna Convention which stipulates that diplomats must remain neutral on matters of policy concerning host nations. Officially, an ambassador’s role is to lobby discreetly on behalf of his government, and to always adopt a low-profile. Of course, this would not be the first time that US embassies and envoys have violated the Vienna Convention in host countries. Washington habitually uses these outposts for fomenting regime change. Richard Grenell, however, has openly flouted these norms and acted as an unabashed mouthpiece for Trump, echoing the president’s contempt for the German government of Chancellor Angela Merkel. The upshot, according to Der Spiegel, is that Grenell has become politically isolated in Berlin. Merkel “keeps him at a distance” and most politicians, except for the AfD, have shunned his contact. After the latest controversy of writing warning letters to German companies, it may be the final straw for Berlin’s tolerance. Already, the German media have been commenting on how the “trans-Atlantic partnership” is finished under Trump. Business newspaper Handelsblatt commented previously: “Nothing in trans-Atlantic relations is normal any longer… Berlin has for too long clung to the illusion of trans-Atlantic normalcy… the era of close ties is now over”. Moreover, there are increasing calls among German politicians and media for a “strategically autonomous Germany and Europe” unfettered by Washington’s policies. Such a development is long overdue and its necessity long predates Trump. Since the end of the Second World War, Germany has resembled an occupied country for American military power and a subordinate to Washington’s political objectives. The primary objective has always been to prevent Germany from developing a natural partnership with Moscow, previously with the former Soviet Union, and subsequently the Russian Federation. The absolute disregard for German sovereignty was perhaps best demonstrated not by the Trump administration, but during the presidency of Barack Obama when it emerged that American intelligence agencies were tapping the personal phone calls of Chancellor Merkel. If that’s not colonial arrogance, then what is? Yet the German political and media establishment barely protested over that infringement by Washington on the country’s sovereignty and its leader. What Trump and his cipher-envoy in Berlin have done is take the arrogance to an unbearably overt level. Trump has been kicking Germany for alleged “unfair trading practices”, denigrating Merkel over her refugee policy, browbeating Berlin to double its spend on NATO military budget, and lambasting German businesses for not complying with Washington’s hostile foreign policy towards Iran and Russia. Trump in his boorish style is merely laying bare the long-presumed US hegemony over Germany. And it’s not a pretty sight. Berlin is being shamed into having to be seen to stand up to this American bullying. The absurdity is that the US and its NATO acolytes have been foaming at the mouth for the last two years about alleged and unproven Russian interference in domestic politics of Western states. Whenever the glaring reality is it’s the Americans who are driving horses and coaches of interference through their supposed allies, who are evidently vassals.